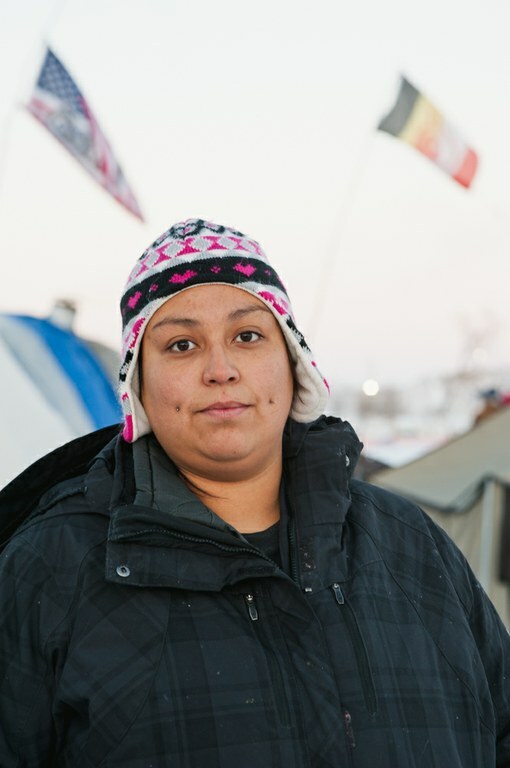 Drea Rose, 31, lives in Spokane, Washington, and is a member of the Spokane Tribe. 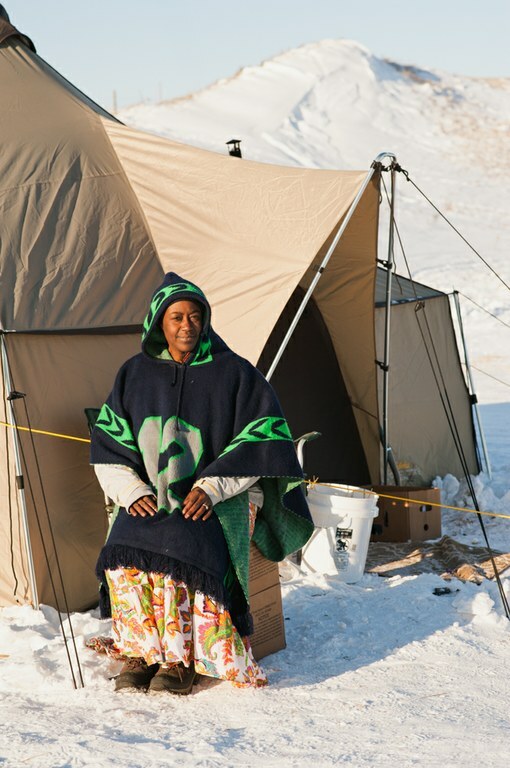 She arrived in camp in November, and spent over a month there. “Growing up on the reservation I’m taught a lot of things: ‘This is the way we do things and this is the way it is,’ but I was never really taught why. Coming here, I was able to learn a lot from the people and the stories. When you’re living life, it’s so fast paced, and I guess we don’t take time to tell the stories behind the things we’re taught. So I was able to learn a lot about my culture and the reasons why we do things. Here, they strongly believe women are sacred, and they were taught the story behind it — that we came from a woman. It’s a beautiful story. There was a curious little girl, who fell from outer space onto a turtle’s back. The woman came first, and the man came from the woman, and that’s why women are sacred. I have girls, so I definitely need to pass that down to them. There’s a lot of men that we need to reteach, reteach the right way. 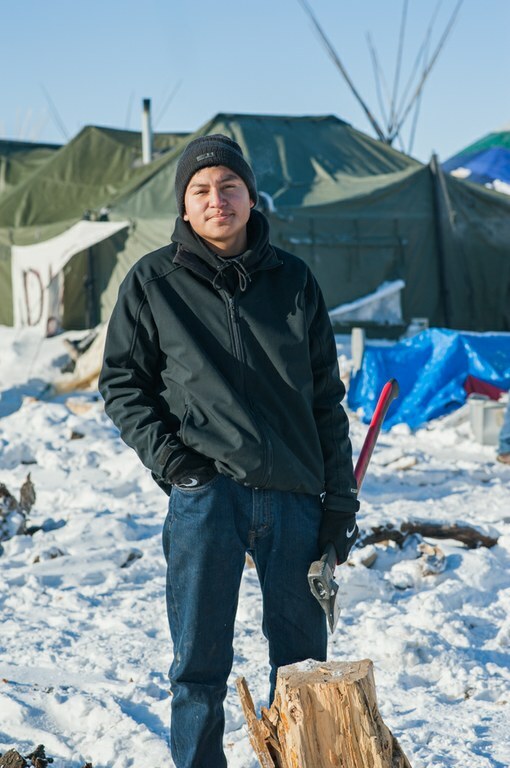 Darren Cross, 17, of Pine Ridge, South Dakota, has spent a month and a half at Standing Rock since the end of summer. He plans to stay until Jan. 1. He has volunteered at the camp to chop wood, and build tents and wood stoves. “(Before) I came up here, I had kind of an attitude, where I didn’t want to do anything. I was lazy all the time. But ever since I came up here, I’ve been busy the whole time. Being up here, I have a lot of responsibilities, and when I go back home I have a lot of responsibilities I need to get to: Go back to school, help around the house. I just live with my dad. It’s me, my dad and my little sister. It’s kind of tough, but we’re getting through it. When I go back home, I’ll be more mature and responsible. 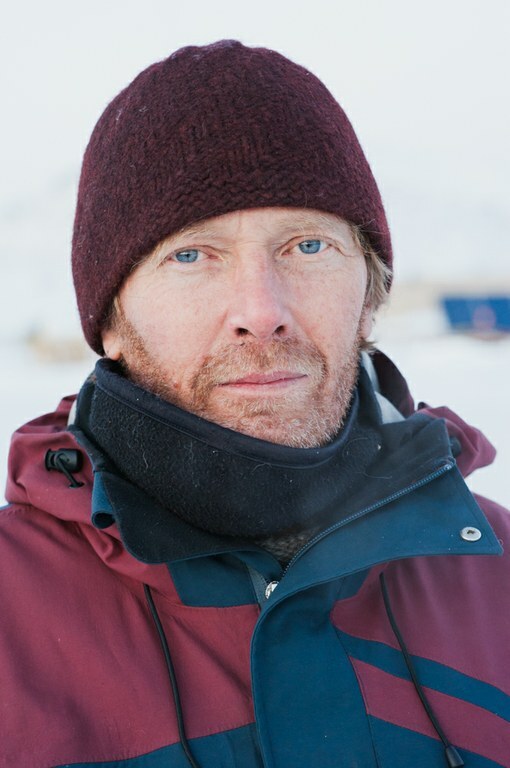 Bryce Peppard, 52, is from Oregon and Idaho. He came to camp in early December with the veterans group. “I’ve been experiencing apathy for a while. (Standing Rock) has changed the way I think about our government treating its own citizens and finally realizing that they are using tactics that they were using when people were run off their land to begin with. I thought it was a non-issue, but there’s so many pipelines going through their land, and up until recently they had no say in it, no power, and up until recently they had no voice. Andre Perez, 46, is a member of the Kanaka Maoli tribe from Oahu, Hawaii. 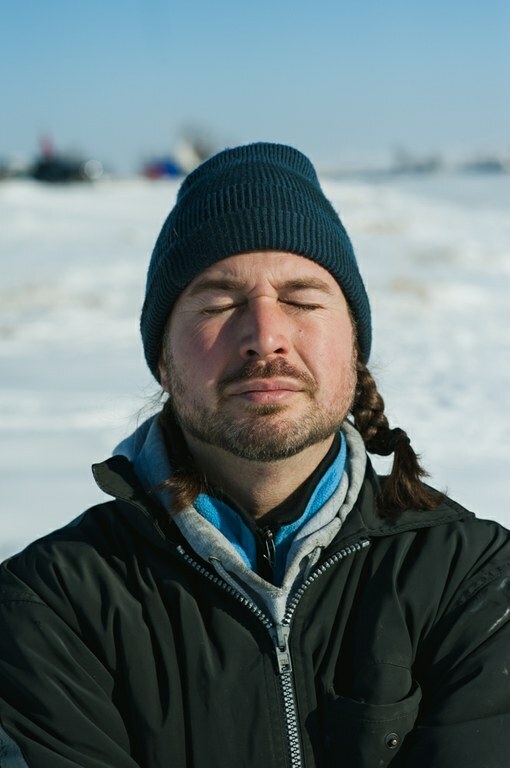 He has made two trips to Standing Rock and volunteered as a non-violent direct action trainer. “It has allowed me to develop and enhance my skills (as an activist/organizer/trainer), taking it to another level that I can take back home. The training, the analysis, my understanding of what’s important during a direct action of this level, with this kind of high-level aggression. It’s given me an experience of what’s important and how to keep people safe, and strategies and tactics and messaging. This whole camp has taught me about how to hold space in a large way, what anywhere from two to 10,000 people can do, and what the limitations of that are. Like when the vets rolled in, their estimates were 10,000 to 12,000 people, and that was too much. It wasn’t safe, and then the storm rolled in. "I learned about increased organizing on that level. I learned about strategy and tactics against big power, law enforcement and corporations. I learned about community and taking care of one another. This whole experience has been, I wouldn’t even say learning, I would say transformative. 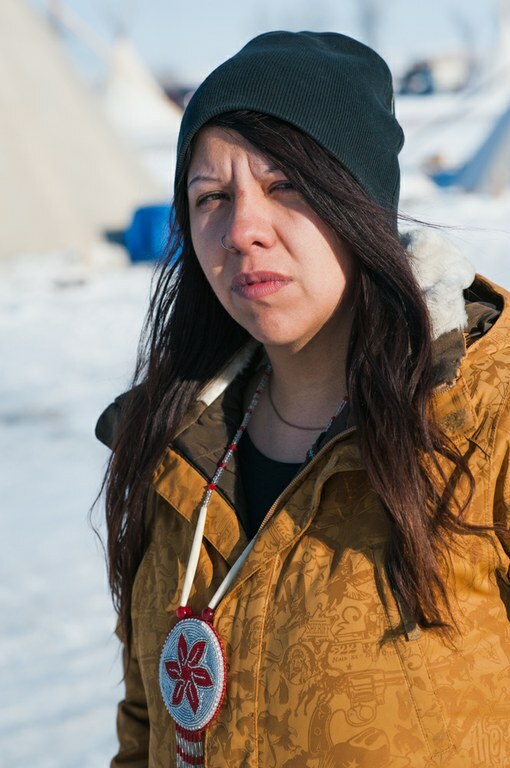 Veronica Vargas, 25, lives in Eagle Butte, South Dakota on the Cheyenne River Sioux Reservation. She has been in camp since late September and says she will stay "until it’s over." “I overcame looking at different races differently. Growing up, we were only allowed to look at it certain ways, because of the history and our grandparents’ grudges. Being here it taught me that we’re all human, we are. We all have feelings. That color doesn’t matter. "The way my grandpa would tell me, he would say, ‘(The police) are blind, they don’t have a heart.’ But there’s a lot of people that are here for the right reason. We’re all here to do one thing. That’s when we start to open our heart up to other people, to letting them in, to let our barriers down, and we start to trust again where we weren’t able to do. Dinea Evans, 33, of Seattle, Washington, has spent about three weeks at camp over three trips to Standing Rock since November. “The one thing I wasn’t expecting to get from all this was a spiritual awakening. I prayed a lot. I got back in touch with my spiritual roots. "It happened in Seattle at a rally that one of my friends put on. She asked me to give a speech in support of Standing Rock. After I gave the speech, they came in with their drums. I knelt down to give some space for the drums, and after they began chanting and singing, I just felt something in my heart, and I began to pray. I hadn’t prayed in a long time. I felt compelled to come out here after that. "I have continued to pray when I’ve gone home. 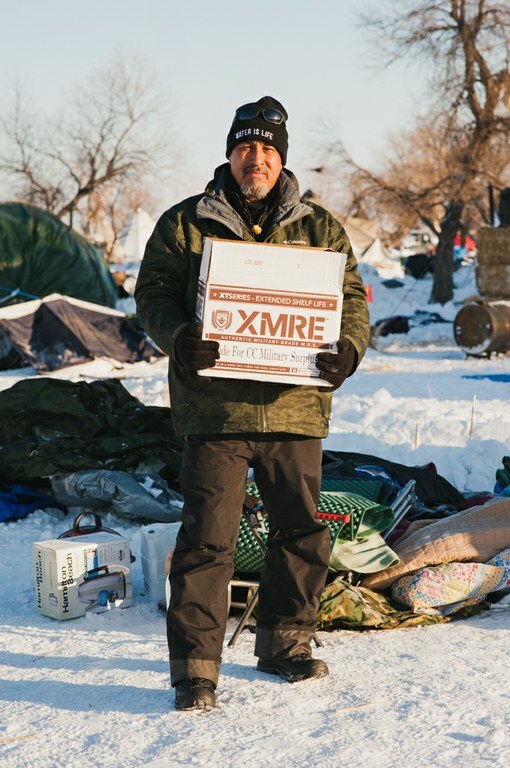 Nick DiCenzo, of Denver, Colorado, has made multiple trips to Standing Rock and plans to stay through the winter. “Community building and activism is apparently huge on my personal agenda, and I never really knew that. It wasn’t until Standing Rock that something was ignited in me to come help, and I think that I have realized from coming here that I am an activist, and I would have never known that.